If you live in warmer parts of the country, where winter is shorter, and days above freezing are common, then your garden doesn’t have to be a blank canvas of twigs and leaves all winter. There are several amazing plants that bloom during the coldest, darkest days of the year, that make winter much more exciting in the garden. Even in colder areas, where snow and freezing temperatures make winter blooms impossible, you can get a jump-start on spring with shrubs that flower just as the snow is melting – early heralds of warmer days to come. Let’s look at some good choices of flowering shrubs that bloom in winter – with something for everyone, no matter where you live. Adding these to your garden will extend the interest and pleasure flowers give you, and you may even be able to have something in bloom in every month of the year. These shrubs are well-known in the south, and if you live in zones 7, 8 or 9 you can grow them right out in your garden. There are literally hundreds of varieties of these wonderful evergreen bushes, and they are all covered in large, exotic flowers. The color range is from white, through every shade of pink, and into reds of all depths, and even some purples. Flowers can be geometrically formal in shape, informal ‘pom-poms’, or more open, with yellow centers. With the right choice of varieties, you can have blooms from January to March with the Japanese camellias, and again in fall, with the sasanqua camellia group. This means that with a carefully-chosen selection, you can have blooms in the garden from October to March – an amazing possibility. What is less well-known is that even if you live in cooler areas, or your garden does not have the acidic soil these plants prefer, they can be grown in pots for many years, developing into large plants with hundreds of blooms on them. They need very little heat in winter – just protection from frost – so if you have a well-lit porch or sun-room you can grow them inside during the coldest months, while they bloom, and then place them outside in a partially-shaded area for the rest of the year. There is no reason everyone cannot grow at least one of the gorgeous shrubs. For something truly exotic and exciting in your garden, if you live in zone 7 or warmer, the Paper Bush takes some beating. This is one of those plants that when first seen, all you want is to have one. For most of the year this plant, Edgworthia tomentosa, looks like an attractive enough, but not stunning, green bush. In fall the leaves turn yellow and then drop to the ground, revealing a framework of sturdy branches, studded with curious buds covered in silver hairs. As the coldest months pass, perhaps by February, these begin to open, revealing clusters of many small flowers that open yellow and soon turn white. The effect is like hanging exotic, glowing Christmas ornaments on a shrub. As an added bonus, the flowers are richly perfumed, and fill the garden with a delicious fragrance. The Paper Bush is a fairly new arrival in the USA, although it has been grown in Europe for a long time, since it was brought from its home in Japan. Despite its exotic appearance, it is easy to grow, preferring a well-drained soil enriched with plenty of organic material. It is not particularly drought-resistant, so keep it well-watered during the summer months. It will not be long before it starts to approach its mature size of 6 feet or so, with a rounded form that fits perfectly into any garden. Staying in the warmer zones of 7 to 9 – don’t worry you cold-zone gardeners, your turn is coming soon! –the Osmanthus, or Tea Olives are often-ignored plants. These modest shrubs are great foundation evergreens, with their rounded forms and small, dark-green leaves. They are sometimes trimmed into hedges, but too much trimming takes away their main feature, which is the white, sweetly-scented flowers that come in late fall, and sporadically through winter. Some varieties prefer to wait instead until the first hint of warmer temperatures in late winter. You may need to look closely to see the clusters of white flowers coming from the point where the leaves meet the stems, but you will certainly know something is going on, because you cannot ignore the rich aromas filling your garden. The scent is a mixture of peaches, orange blossoms and jasmine – like a rare designer perfume. Plant one below a window, and then open it just a little to let that wonderful fragrance drift through your home – a true joy! If you live in zones 4, 5, and 6, by now you may be feeling a little left out. The bad news is that for you, winter blooms are only going to be possible with something indoors, like those camellias we mentioned, or perhaps a citrus bush. However, you can get a big jump on spring by growing some hardy shrubs that are not strictly-speaking winter flowering, but certainly leap into bloom while there is still snow on the ground. These early heralds of spring deserve a place in every garden in colder regions – you certainly deserve a reward for having survived another winter! These deciduous shrubs grow well in the open, or along the edges of wooded areas. They are mostly broad and upright bushes, although some are more like small trees. Just as the snow is melting, the branches are covered in pure-white flowers, like beacons of hope for the return of leaves and flowers. There is something magical about them blooming away while all the other trees are still sleeping soundly, and with one of them in your garden you will see proof that spring is truly around the corner. These are easily grown shrubs, that thrive in most soils that are not too dry. They have no particular pests or diseases, and they are hardy right down to at least minus 30. They have the added bonus of producing edible berries that can be substituted for blueberries in any recipe. They make great preserves and jams. Their fall color is spectacular too, in yellows, golds and reds, making this a great all-round shrub for every cooler garden. Finally, another early blooming tree is certainly one that no cool-region garden should be without. 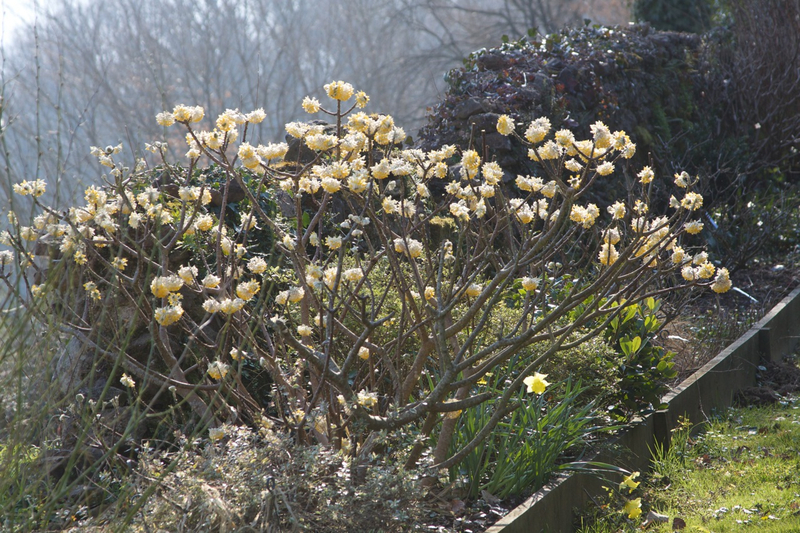 So exotic and large are the blooms on the deciduous kinds of magnolias, they look almost out of place – but still very welcome indeed. These small trees can be grown all the way from zone 4 to zone 9, and in warmer zones they are truly winter-blooming, with their fat flower buds bursting into bloom as early as February. In cooler regions you will have to wait until April, but the snow is no sooner gone than the first, and hardiest of them, the star magnolia, opens its pure-white blooms. An excellent variety to choose is called ‘Royal Star’. This is followed closely by the others, with their more vase-like blooms, growing upright on the branches. These are shades of pink, often darker on the outside than inside of the blooms. They crowd the bare branches, bringing wonder and enchantment to your garden. They are easily grown in most gardens, and small enough to fit into almost anywhere. Plant one this spring on your lawn – when you look out and see it blooming away in the cold days you will be so glad you did! Hi there, I have a property in north Florida, High springs to be exact. I have a peculiar Bush-tree rubbery looking branches with tiny shiny little leaves then in february-march it gives white tiny flowers all bunched together, displayed in a bulb-bunch, just stunning!, This plant looks like a bush in some areas and it had grown like a short tree in other areas, can not find the name of this plant, maybe you know what Im talking about? This plants is all over the area above Gainsville, but I have not been able to find anyone that knows the name of this plant. I will take a guess and suggest it is Japanese pittosporum, https://en.wikipedia.org/wiki/Pittosporum_tobira. Widely grown around the world in zones 9 and 10, and very tough. Is this it?